Virtualization using VMware technologies offers enterprises great benefits - cost savings, energy savings, operational efficiency from resource sharing etc. At the same time, virtualization also introduces more complexity. There are additional layers of software and hardware to be managed. Users of virtualized applications expect the infrastructure to be as reliable and as fast as their experience with applications on physical infrastructures, and a single failure in the infrastructure can cause a slow-down in application performance and can impact the user experience and key business processes. 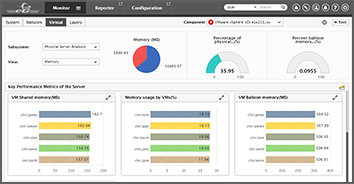 More often than not, VMware performance management tools are limited: they provide graphs and reports on virtual machine and hypervisor resource usage, but do not have visibility beyond the virtualization tier. They also provide a lot of raw data that administrators have to sift through to determine what is wrong – there is very little actionable information for administrators to quickly determine what they need to do to keep their VMware infrastructure working at peak performance. Performance management tools that are silo-oriented are not sufficient to manage today's complex, inter-dependent IT infrastructures. When users complain about performance problems, the problem could be anywhere in the infrastructure - it could be in the network, or the database, or the application, or storage, or in the VMware servers. These are the toughest performance problems that IT administrators have to handle. IT administrators are provided access to a number of specialized tools for each infrastructure tier, and they often struggle to determine the true root-cause of a problem. Problem diagnosis is time consuming, requires a great deal of expertise and often involves lengthy bridge calls between operations staff and when all this happens, the user experience and service performance suffers. eG Enterprise suite is a complete performance management solution for IT infrastructures that are partly or fully virtualized. By monitoring every layer of every tier of the infrastructure - from network to the servers, from the virtualization platform to storage, eG Enterprise provides administrators with total performance visibility. 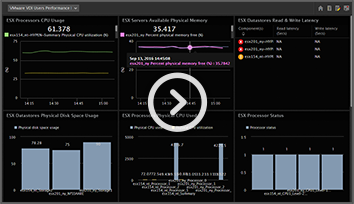 With the eG Enterprise monitoring, diagnosis and reporting solution, administrators get actionable insights into the true cause of cross-domain service performance issues so they can dramatically accelerate the discovery, diagnosis, and resolution of service performance issues in their virtual, cloud, and physical infrastructures. Monitor the performance of every layer, every tier of the end-to-end service so you know what's working and what's not. In-depth visibility inside each application's performance so you know how the application is performing, how its virtual machine is performing and how the hypervisor it is hosted on is performing. 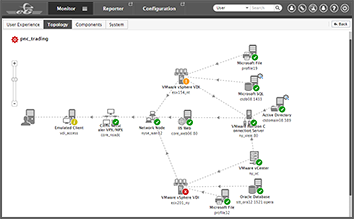 Auto-baseline your VMware infrastructure; Get proactive alerts when your infrastructure usage and performance are abnormal. Automatically correlate across metrics from different tiers to identify and fix issues before users call. Identify bottlenecks, top resource consuming applications and VMs to right-size your environment for maximum ROI. eG Enterprise, is certified VMware Ready, and Partner Ready for VMware Cloud on AWS. White Paper What should you look for in a Virtualization 2.0 monitoring solution?